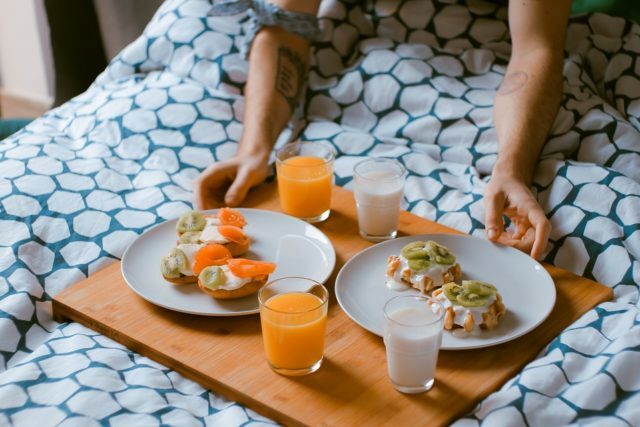 A late night snack in bed might seem like a good idea, but it can seriously derail your efforts at maintaining a healthy lifestyle. Not only are you adding extra calories right before your metabolism slows down for the day, but you’re opening yourself to problems that affect your ability to get a good night’s rest. Everyone gets the late night munchies once in a while. At one point in time, scientists believed that a calorie eaten at 8 am had the same effect on the body as one eaten at 11 pm. However, studies have shown that timing plays an important role in how food is processed and the consequent energy stored. Food eaten at night, when your body’s natural circadian rhythms want you to sleep, is far more likely to be stored as fat than food eaten during regular daylight hours. The body changes how it metabolizes food eaten during those off hours. If you’re eating late into the night, you’re setting yourself up for unwanted weight gain. Not only can late night eating lead to weight gain it can also cause sleep disturbances. Discomfort from a full stomach leaves many people tossing and turning. If you’re eating or drinking foods with caffeine, your body could be buzzing long into the night. Eating at night is also associated with acid reflux, an uncomfortable condition that makes sleeping difficult. All these sleep disturbances get in the way of your body doing important work while you sleep. At night your body’s energy reserves can be used for repairing, rebuilding, and rejuvenating. If you’re not getting a full seven to eight hours of sleep, the brain can’t clean out pathways and store away memories properly, the immune system reduces inflammation and fights illness, and muscle tissue repairs and rebuilds itself. Everything you eat during the day plays an important role in the quality of the sleep you get at night. Your overall health depends on smart eating and healthy choices. Eat Regular Meals: Skipping meals may lead to overeating late in the day as your body feels the need to make up for lost calories. Regularly time meals keep your blood glucose level steady throughout the day. You’re more likely to feel full at night if you’ve gotten enough calories by the time you’re ready for bed. Snack Smart: Late night snacks are not bad altogether, but you do need to be smart about it. If hunger pains keep you up at night, keep some healthy snacks on hand that contribute to good sleep. Foods with calcium like milk, cheese, and yogurt help make melatonin, a sleep-inducing hormone. Bananas and almonds also have vitamins and nutrients that promote good sleep. Ban Snacks from the Bedroom: Your bedroom should be a sleep sanctuary, not a snack bar. If you need a late night snack, eat it in the kitchen so your brain knows that the bedroom is devoted to sleep. Eating in your room can confuse your brain and attract bugs, which brings with it a whole new set of problems. Comfort: If you’re prone to late night eating because of an uncomfortable mattress or pillow, don’t hesitate to try something new. There are mattresses that support different sleep styles—side, back, stomach—so don’t let discomfort keep you reaching for food when what you really need is a different mattress. Next articleCannabis and Chronic Pain: How CBD Can Help Manage Your Pain?